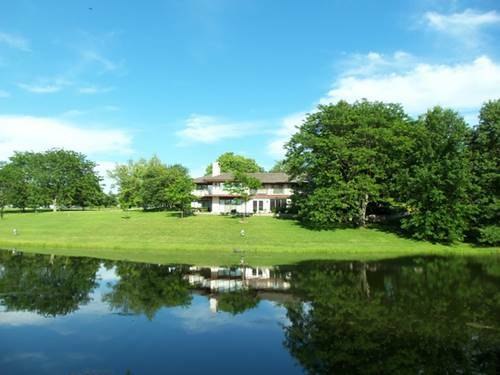 This private country retreat is only minutes to I-88 and 1 hour to downtown Chicago. It is situated ideally whether you are looking for a weekend getaway or full time home. The all brick ranch is on 14 acres with a private pond. The house has over 4,000 SF on the main floor plus a full finished walkout basement. All bedrooms are en suite. The big living room has a fireplace and the sun room has a mini wet bar. There is an in-law or caretaker apartment with full kitchen and private bath. The lower level has a bedroom, full bar and fireplace. There is a big deck off the main floor, screen porch and huge patio off the walkout basement--all with great views overlooking the pond with fountain. Swimming fishing and skating--the pond is 14' deep and a delight in every season. There is an orchard with fruit trees, a garden, a barn and tennis court. This secluded estate behind a gated drive is a rare find. For more information about 49W226 Jericho, Big Rock, IL 60511 contact Urban Real Estate.